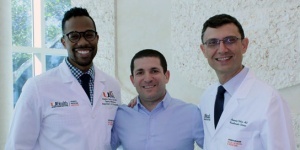 From left, Stephen Henry, D.O., Jesse Marks, and Mauricio Cohen, M.D. In recognition of American Heart Month in February, Marks, a University of Miami alumnus and longtime employee, is telling his story to raise awareness about heart disease and to encourage others to keep themselves heart healthy. Dr. Henry quickly sent Marks to see Mauricio Cohen, M.D., director of the Cardiac Catheterization Laboratory at UHealth Tower, part of the University of Miami Health System, who quickly scheduled Marks for cardiac catheterization. Marks listened and changed his lifestyle. He adhered to a new medication regimen, changed his eating habits, and went to cardiac rehabilitation at UHealth, where he credits UM therapists Sabine Gempel, PT, DPT, and Yessenia Orozco, PT, DPT, and Jessica Fermiza, APRN, with saving his life. In addition to the improved heart function, Marks says he has no issues now with headaches, sweating and sleep problems. He says he has also learned to go for regular check-ups and to take care of his body through routine preventive care.